Rep. Ilhan Omar (D., Minn.) on Monday praised a Democratic activist while retweeting a thread in which he described the American Israel Public Affairs Committee, a pro-Israel lobbying organization, as "a central pillar of the occupation." Omar's message came hours after she apologized for multiple tweets from Sunday that lawmakers and commentators from both sides of the political aisle condemned as anti-Semitic. ". 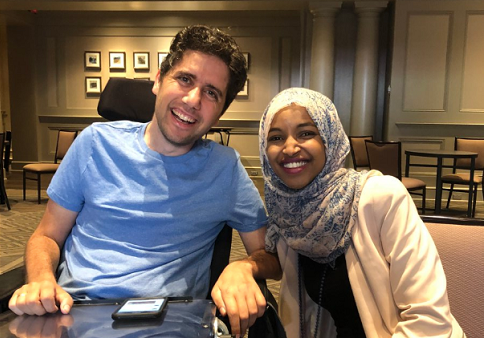 @AdyBarkan your courage can’t be matched," Omar wrote on Twitter. "I am often in tears thinking about how you won't be with us in this fight and how I am going to miss your presence and courage. In solidarity my friend, in solidarity." Omar ended her tweet with a fist emoji. Ady Barkan, a Democratic activist who has contributed to The Nation and works at the Center for Popular Democracy, began his thread by saying it was about Omar, anti-Semitism, and his "personal experience with AIPAC's money." Barkan said that, in 2006, he worked as a staffer for a Democratic congressional candidate who was "very skeptical of military force, opposed to the Israeli occupation of Palestine, etc." The campaign was struggling to raise money when an AIPAC representative offered to contribute $5,000. The representative also wanted the candidate to take a public stance on two issues related to American policy toward Israel. Barkan said he and the candidate considered themselves to be "pro-peace, not pro-Israel." Despite feeling "icky" about it, he said they "put online a statement about how Vic supported a two-state peace agreement and AIPAC's two pet issues of the cycle." According to Barkan, the decision was "definitely about the Benjamins," a reference to Omar's previous controversial tweet. Barkan then argued that "AIPAC is a central pillar of the occupation." "Without Congressional support, the Likud/anti-Palestine/pro-occupation project would be radically undermined," Barkan continued. "AIPAC is the anchor of that support, and its money and Sheldon Adelson's money are indispensable to the work." Barkan then wrote that Omar and Women's March organizer Linda Sarsour are not part of America's problem of anti-Semitism. Barkan ended his thread by expressing disappointment in Speaker of the House Nancy Pelosi (D., Calif.) for condemning Omar's tweets. He accused "AIPAC and its army" of trying "to silence criticism of the immoral, illegal, inhumane occupation by screaming about anti-semitism and claiming that nobody may ever talk about how the Israel lobby uses money to build power." Omar "unequivocally" apologized earlier Monday for comments she made about Israel on Twitter over the weekend. "It's all about the Benjamins baby," Omar's tweet read, with musical notes, referring to $100 bills with Benjamin Franklin's face on them. Forward opinion editor Batya Ungar-Sargon asked Omar to clarify who is "paying American politicians to be pro-Israel." Omar faced backlash from Democratic colleagues, Jewish organizations, and Chelsea Clinton, prompting her to apologize, although she reaffirmed "the problematic role of lobbyists in our politics, whether it be AIPAC, the NRA or the fossil fuel industry." Omar has a history of using anti-Semitic rhetoric and acknowledged last month that she used unfortunate language in a a 2012 tweet in which she wrote that Israel had committed "evil" acts and "hypnotized the world." She also supports the Boycott, Divestment, and Sanctions movement against Israel, which has links to Palestinian terrorist groups. Senate Minority Leader Chuck Schumer (D., N.Y.) has called the BDS movement anti-Semitic. Sarsour, who co-chaired the 2017 Women's March, has ties to Louis Farrakhan, who leads the Nation of Islam. Farrakhan has called Jews "termites" and said Adolf Hitler was a "great man." Sarsour has also shared the stage with Rasmea Odeh, a Palestinian woman who was imprisoned for her participation in two terror attacks. Sarsour said she was "honored to be on this stage with Rasmea." Sarsour has also suggested that Jewish liberals "masquerade as progressives but always choose their allegiance to Israel over their commitment to democracy and free speech." She has blamed the "Jewish media" for her controversial reputation. This entry was posted in Issues and tagged Anti-Semitism, BDS, Ilhan Omar, Israel, Linda Sarsour, Palestinian Authority. Bookmark the permalink.